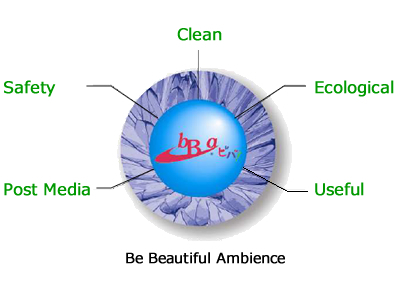 By adding not strength and beautifulness but also special functions to the film we produce a new film which is environmental friendly. The hyper durable layer developed by our own technology is laminated on the PET base layer and easily removable adhesive layer is coated on its backside. 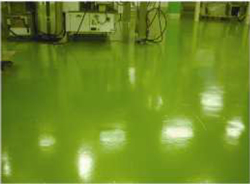 It is easily applied to floors, walls, daily commodities and so on. 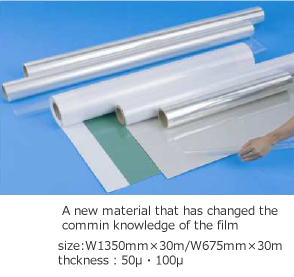 This is quite a new film that adds cleanliness and durability only by laminating on any place. This film creates a new market with our films. Antibacterial, Contamination resistance, Scratch prevention and so on! ■ Safe with unslippable treatment on the surface. Strong against strong acid and alkali. ■ Supplied in various colors and designs. 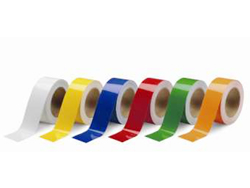 ■ Inkjet printable films that can be supplied. not only in one piece order but also in a major order. 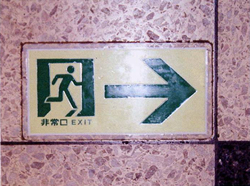 ■ Original floor signs, large size and so on are supplied depending on your ideas. 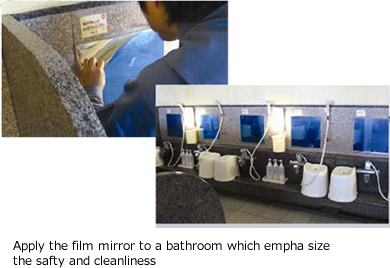 ■ Using the PET based material that is safe to human beings and environments and recyclable. ■ Preventing changes in color and discoloration caused by ultraviolet protection. 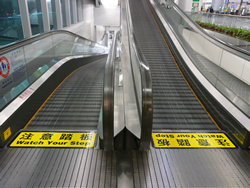 ■ Accessible as littering prevention films. ■ Easily applied and easily removed. ■ Applicable to many places such as floors, walls and ceilings. ■ Protect the surface of all things just by fitting. Create various ways of using this film with you imaginable ideas! 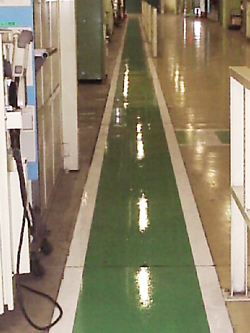 Applicable to floors, walls, stairs, tables or mats at every place: hospitals, factories, restaurants and halls. 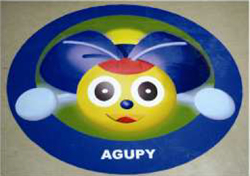 Also possible to use as floor signs for public transportations, entrance mats and advertisement media. Printed mat enhance the functionality and pleasure. 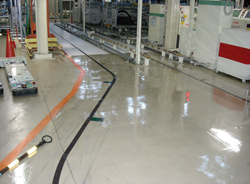 On the factory floor not only for antibacterial and antifouling but also easy maintenance. Line tapes colored in white, yellow and so on. 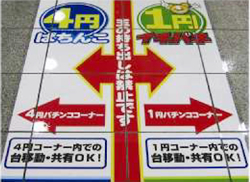 On the floor of a pachinko parlor. Not broken! Light! Scratch free! Beautiful! 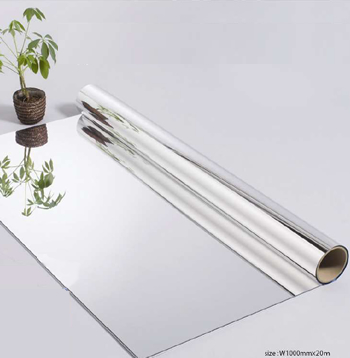 "Hyper durable and antibacterial film mirror"
With the collaboration of high quality aluminum vapor deposition technology and "bBa" coating technology we created a safety mirror which can be applied everywhere. 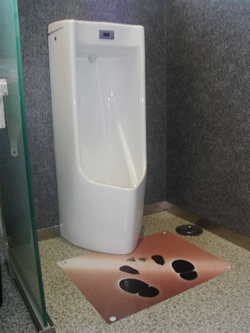 It is applicable to a bathroom and a water closet of a hospital, a school, a senior home. It can be used as a display to small commodities such as furniture, cellular phones, datebook. There appeared a safety mirror that enhances the functionality and pleasure. ※ Wipe out after leaving above things on “bBa sheet” for 3 hours. ※ Put 0.1 ml of test liquid on “bBa sheet” and leave it for 24 hours covering with watch glass. After that wash it away with running water and watch the external change after drying. on, and check the heat diffusivity. ※ The surface of the “bBa sheet” is hard to burn. 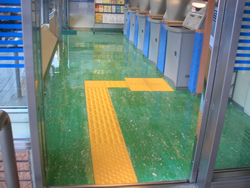 ※ Put “bBa sheet” on PVC tile. ※ These values are not guaranteed. ※ The visible light transmission of the PET material was 92.0% before applying special ultraviolet cure paint. ※ The higher the value is, the higher the transparency is. When the value is 100%, it’s completely transparent. ※ Sand rubbing method : Put quartz sands on the coated surface, and then after rubbing 40 trips by putting the weight equivalent to a man’s weight, and check the gloss value. The higher the value is, the higher the brightness is. Each test result mentioned above was measured by pubic institutions or our company. These values are the data which show the test circumstance of the product surface. They aren’t guaranteed for used materials. The cut surface of “bBa sheet” is sharp enough to require careful handling.